2.Power supply and battery ,two power supply modes, but the power and the battery cannot be used at the same time, at the same time use will cause the machine doesn't work, or even damage the machine. 3.If you don't know how to operate can contact us, we can give you a teaching operation video.and if you have any question please just feel free contact us. Double Speed: Low or high speed, the speed can be adjusted so that novice, children or a master can operate it easily. Suit for sewing beginner,recommended for ages 13 and up,a simple DIY family life sewing machine. 6 Months Guarantee: We will provide customers with the best shopping experience, if you have any questions, whether the quality or operational problems,please contact us directly, either operation or quality problem, we would be happy to help you solve, and provide a 6 months guarantee. 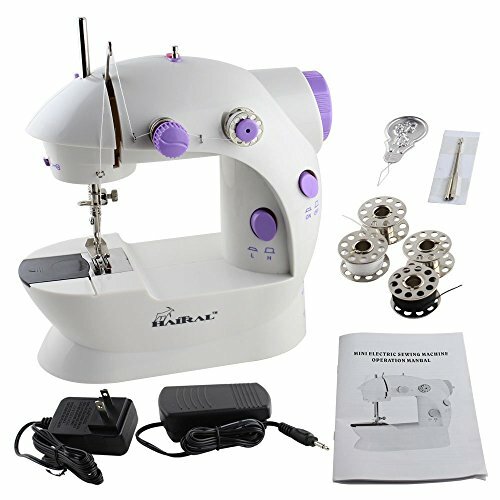 Small and Portable: This mini sewing machine is made of plastic, has a perfect size and light weight can easily carry and move to any place to use it. View More In Embroidery Machines. If you have any questions about this product by HAITRAL, contact us by completing and submitting the form below. If you are looking for a specif part number, please include it with your message.